Quinoa doesn't just have to be a side dish or salad ingredient. We used it in place of oatmeal to create the perfect apple parfait. Looking for a healthy breakfast parfait? Trying to stay away from all that grain? Well, we have one delicious recipe for you. Quinoa is actually a seed,and it is packed full of protein and other healthy nutrients. We gave quinoa a hint of apple pie spice and jazzed up soft cooked apples with just a hint of spice and a little brown sugar. This is your new favorite way to start your day. Boil water and pour in quinoa. Cover and simmer on low until the quinoa is fluffy and no more water remains, about 15 minutes. Fluff quinoa with a fork and stir in apple pie spice. Set aside. In a small pot, add cubed apples, apple pie spice, vanilla paste, sugar and apple cider. Bring to a boil and cook over medium heat till the apples are soft and the cider has boiled down to create an almost syrupy consistency. Let the apples cool before making the parfait. 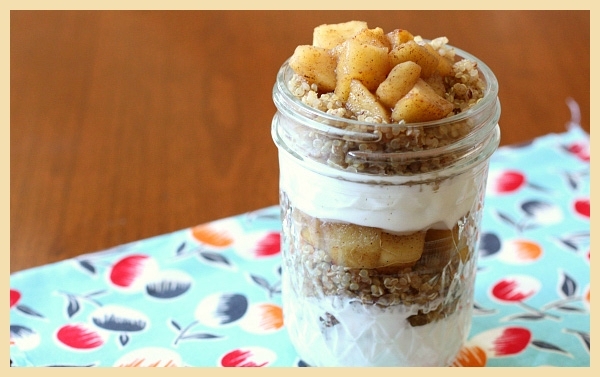 In a Mason jar or small glass, layer in yogurt, quinoa and apples. This dish can easily be assembled the night before and is a great option for an on-the-go breakfast treat.